The first-person camera horror film or "found footage" movie has become all the rage with genre filmmakers over the last few years, and I enjoy the form very much. When handled well (Cloverfield ) or exquisitely-well ([REC] ) the first-person subjective horror movie boasts an incredible amount of immediacy and urgency. Contrarily, when this type of film is not done so well (Diary of the Dead ), examples of the genre can come across as artless and even amateurish; like a bad reality show on basic cable. While not nearly as strong or as powerful as [REC], The Last Exorcism nonetheless utilizes the form of the "found footage" mock-documentary horror film to good effect. Specifically, director Daniel Stamm's effort focuses a great deal on character, much more so than most films of this type, which often tend to focus on one location, or on one emergency situation. In this instance, the character at the heart of the drama is the colorful Reverend Cotton Marcus (Patrick Fabian) of Baton Rouge, Louisiana. He's a glib but good-hearted "performer" who chooses the Christian Church as his stage. Cotton followed his proud father into the Church and now sees to it that the Sunday morning sermons are never boring. He does card tricks for his flock; he uses props and special effects whenever he can to spice things up. He doesn't think he's playing with people's lives; he just thinks he is putting on an entertaining show. Marcus may (or may not...) be a genuine man of faith, but he is abundantly cynical about the nature of man. In particular, he is troubled that some men can so easily manipulate the gullible or the ignorant, especially in terms of faith and religious belief. To wit, Cotton has for years conducted exorcisms (with taped demon noises and other special effects as background noise...) that are shams; but which nonetheless give the suffering souls some belief and sense of comfort that they have been healed. At first, Cotton believed that his involvement was a public service of sorts, and participated happily. On news, however, that a girl has died during an especially violent exorcism (as was also the case in The Exorcism of Emily Rose ), Rev. Marcus experiences a change of heart. In a moment of self reflection, he decides that "doing God's work" in this instance means going against the Church and exposing exorcisms (and demon possession...) as frauds. To that end, Cotton invites a documentary crew to follow him on his "last exorcism" in Ivanwood, Louisiana. There, an innocent teenage girl named Nell (Ashley Bell) is allegedly possessed by a demon and murdering her father's livestock on a nightly basis. The camera crew will observe as Cotton guides Nell and her family through the possession, revealing for the documentarians all the tricks of his trade. And then, of course, Cotton will collect his cash and leave for home. ...But of course, that's not at all how things end up. Not at all. The early portions of The Last Exorcism do a stellar job of introducing Reverend Marcus, inter cutting ably between talking-head interviews with Marcus and his wife and B-roll footage of his father's "demon book," which contains all the names of the demons that might possess the living. These early passages are highly engaging, and more importantly than that, are just about the best "faked" moments you've probably seen in a found footage horror film lately. The chronicle of Cotton's life in the Church -- and his reasons for turning his back on the barbaric practice of exorcism -- seem very, very authentic. There's no hint of fakery or of "acting" in these moments. You accept the character and his choices as real. These moments also lay out the beginning of Cotton's intriguing character arc. I won't reveal the parameters or trajectory of that arc, but suffice it to say that the glib-but-good-hearted showman is landed into a harrowing situation wherein his beliefs and faith are called into question. His very words are held to account. He must finally decide: Man of God or Show Business Charlatan? As The Last Exorcism settles down into the heart of Nell's case, in an isolated, rural farmhouse, the movie grows increasingly creepy and disturbing. There's a constant tension present in the screenplay and its presentation between opposing philosophies. Is Nell mentally disturbed? Extremely susceptible to fundamentalist indoctrination and the suggestion that she's possessed by a devil? Or is she actually harboring a demon? Who, precisely, is conning whom? Is Cotton playing the family? Or is the family playing Cotton? And if the latter is true, what is the reason behind that act? Is Cotton actually up against a diabolical showman with many more "special effects" in his quiver? 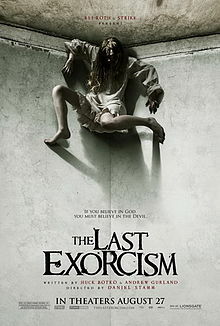 Commendably, The Last Exorcism also innovates some with its by-now-familiar first-person subjective P.O.V. form. In one unexpected moment, Nell -- apparently possessed by the demon -- picks up the video camera and goes on a murderous bender (with the family cat as victim...). That's something these first-person movies don't show often: the killer literally "possessing" our eye on the narrative events. I also enjoyed the film's setting, in rural Louisiana. The region has existed under "six different flags" over its long history, and the place is what Cotton calls a melting pots of different beliefs "rubbing up against each other." In other words, the perfect setting for a supernatural horror film. I'm not entirely thrilled, let alone satisfied with The Last Exorcism's denouement. The film's last shot is an unnecessary swipe from The Blair Witch Project (1999), and the resolution of the ambiguity -- of the film's central mystery -- is confusing. Cotton's actions during the last act are wholly understandable: he must select a side and fight for it. But I do have questions about the motives of some of the other supporting characters involved in the climax, especially as it pertains to earlier behavior in the film. Despite this, I still recommend The Last Exorcism for fans of the found footage horror sub-type, and also for horror movie enthusisasts in general. Patrick Fabian has created a memorable character in Reverend Cotton Marcus, and I enjoy how the movie frequently weighs the moral pitfalls of his character. Cotton is responsible for his words...even if he doesn't mean them or even entirely believe in them, and The Last Exorcism hammers that point home effectively. If Cotton -- in his capacity as an expert -- tells Nell's father that "death is the only salvation" for a person possessed by a demon, then he's at least partially responsible when the farmer picks up a shotgun and aims it at his daughter, point-blank range, in an effort to save her soul. Cotton slowly becomes aware of his responsibility, and that's what keeps him from extricating himself from the growing horror..and stuck in that farmhouse. He realizes that his words and his choices have played a critical part in what is happening. And in a weird, unsettling way, this aspect of The Last Exorcism is actually a reflection of our current national discussion. When do words go too far? When should "showmanship" for entertainment's sake cease? When do entertaining words become a call to unfortunate action? I don't want to belabor that point, because we all see this matter differently, but The Last Exorcism is an interesting meditation on personal responsibility, and an excellent character study of a "showman" who makes questionable choices. I keep hearing about how the ending for this film really messes up a good movie. I have it in my Netflix queue. Thanks, John. I found the ending refreshingly daring. It forces an evolution in the character. The handheld camera works well here, mostly because the acting plays naturally to it. A little gem, it handles its subject matter intelligently. Thank you both for writing such great comments on The Last Exorcism. Le0pard13: I think you will appreciate the film. It's a good horror movie, and I'll be curious to hear your take on the last scene. jmcozzoli: I'm not at all sure you are wrong in that assertion, vis-a-vis the ending. It struck me as off-tone and surprising while I watched, but I'm not always right about such things. In a horror movie, surprise is good...and I was certainly surprised! As far as character arc, you are absolutely correct there too: the last scene does force the evolution of the character. I also agree with your conclusion that the movie is intlligent and a "little gem." I give the film overall high marks, but I'm still ambivalent about the ending. There's something about it that feels rushed; and I'm not sure how Nell's brother fits in regarding the whole plot line either. I am another one who really enjoyed the film until the ending, and I usually like quirky or downbeat endings. Great review! I am not just a fan of FF horror, I'm driving the freaking bus! !I have yet to see a film of this sub-genre that does not guarantee the viewer at least 2 or 3 genuinely scary moments. The lone exception being the putrid 'Amityville Haunting' (omg that film was bad!) Though....even that had one very good scene, I must admit. I digress... 'The Last Exorcism' is better than most FF films, certainly not on the par with BWP or Rec, but if you like possession films and/or FF films, you gotta see this.